Yay, December is here and I’m feeling festive! It’s my birthday too in a couple of weeks so I’m sure I’ll be doing plenty of celebrating. I’ve had another mixed month, with highs and lows but the highs have been great and helped to make up for the lows. Am I completely ready for Christmas? No! I still have so much to do but I’m really looking forward to enjoying it with my family and I hope you are too? Did I achieve my November goals? I think I met all of my November goals partially but not completely. I did a bit of pampering, some organisation ready for Christmas, some photography presentation and wrote a seasonal blog post. Yes, I could have done more but I don’t think I did too badly when up against yet another nasty cold which aggravated my MS. I felt great on my good days this month so I fully made the most of it. I was able to do a bit more driving and even took myself swimming twice (ok so I stayed for 15 minutes and only did about 12 lengths but it’s still progress)! We even went shopping in Manchester for a few hours as a family which was fantastic. It was great being able to go, although it was absolutely exhausting and I had so much fatigue after. It’s the little things like this which help to keep me positive and make me feel like I’m on the right track with the diet and lifestyle changes I made a few months ago. There are certainly no miracle improvements but even a slight change feels amazing and I will take what I can get! I’ve been enjoying being able to look after my son a bit more in the mornings and we have been going on little strolls after breakfast which has been really lovely. 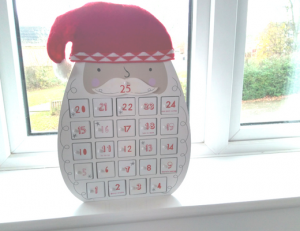 I’ve also had so much fun coming up with and preparing an advent calendar of activities suitable for my 3 year old which I can’t wait to get started on and enjoy together throughout December! Preparing my seasonal blog post was so much fun! 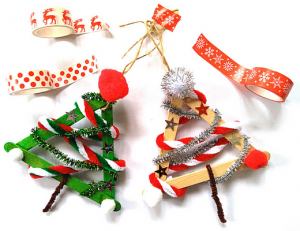 I created a creative Christmas tree ornament craft tutorial, which I will try later on this month with my son as one of his advent activities. 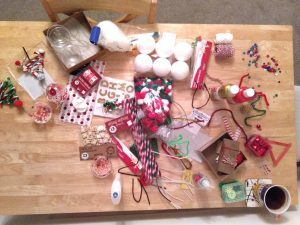 It was great shopping for all the different Christmas craft materials I needed and then getting it all out and just have fun being creative. I’m so glad that despite my MS I still get to be artistic and crafty. I might not have as much energy but one thing I do have now I’ve finished teaching is a lot more time (and a lot less stress too)! To keep up all my hard work with my diet and lifestyle changes now Christmas and all it’s tempting food is approaching. I think Christmas is going to be a real test of my resolve. I’ve always loved chocolate and cheese and I’m sure I’ll really miss all my Christmas treats! I need to find some healthy alternatives which are quick to prepare and don’t involve around 50 ingredients. If you have any suggestions I’d love for you to share them. I also want to continue swimming as well, whenever I’m able, as it’s such a great form of cardio exercise for anyone with MS if they’re able to go. Let’s hope I get a few more opportunities to go throughout December! To have fun completing our advent activities together and to have a great family Christmas! I’ve tried to keep our planned advent activities low-energy and manageable so we can all have fun together. Wish me luck and I’ll let you know how we get on! Also, I’d love to have a great family Christmas, as we all would, which for me means to just enjoy being together as a family, without putting pressure on myself to do more than I can realistically manage or try to be too perfect. If it means I have to decorate the Christmas tree in 3 sittings with rests in between again this year then I need to stop beating myself up about it and just enjoy doing what I can! 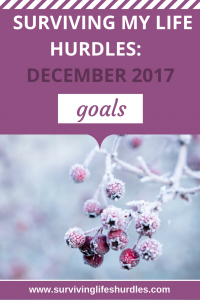 Caz from Invisibly Me wrote a great article recently about perfectionism which I think is an issue which impacts on so many of us at this time of year. Please check it out if you haven’t already! To lighten up a little, stop taking life so seriously and enjoy having fun! An unusual happened the other day. I was out in a public setting (which doesn’t happen as often as I’d like now) and I was sat next to a group of people whose behaviour was so completely alien to me that I was genuinely shocked by it. They were giggling, acting light-hearted and carefree and just a little bit silly. I wasn’t used to it and it made me realise how much this relaxed attitude to life is missing from my life. I’ve always had a tendency to be serious and worry about things too much but since MS forced itself into my life I often feel like I have the weight of the world on my shoulders. There’s no space for feeling light-hearted when every day is about navigating fatigue and whichever other MS symptom(s) of the day I’m experiencing. But you know what, life is more about always being serious and focusing completely on survival, it’s about enjoying what you can and seeing the funny side of things. So my goal for December is to do things which make me to forget my worries every now and then and just have fun! To come up with a detailed plan of where I want to take my blog over the next year, the articles I want to write and the ideas I want to focus on. In January my blog will be 1 year old and when I wrote my first article I never could have imagined what a great experience blogging would be. I’ve met so many amazing people, I have a brilliant support network and a great creative outlet too. But even more importantly, I’m helping others with their problems, even if it’s just by letting them know they’re not alone. I was recently really pleased to discover my recent article, 9 ways to help manage your fatigue (part 2), has fast become one of my most popular blog posts in a really short space of time. It’s things like this which really help to keep me motivated with my blog and I’m really looking forward to creating some new chronic illness blog posts. The new year is a great time too to take stock and set some fresh goals. Watch this space for plenty of helpful, personal and interesting content in 2018! I really hope you have a great December and that your Christmas preparations are going well! Wishing you all the best.